I picked up a hardcopy of Botticelli Mag Issue 8 for eight dollars last month at the place of its publication, Columbus College of Art & Design, Columbus, Ohio, where I was attending my son’s graduation from that institution. I read it in fits and starts since then, finally completing the ninety-page collection today. The art is varied, eclectic, creative, and for the most part fun. For the most part the photographs did not rise to the level of art, unless I am missing something, but many of the illustrations were as good as anything I have seen offered by the Nerman Museum of Contemporary Art and Kemper Museum of Contemporary Art in the Kansas City area. I particularly like the creepy yet stunning drawings by Komikka Patton and the fairytale two-page illustration by Seulki Choi. The opening prose piece by Anna Peluola has a Kerouac-ian feel to it that had me grooving to its rhythm. I enjoyed the way that the narrator took the mundane and made it interesting. Her description of what it must be like to be an artist from the outside looking in really moved me personally, having raised artistic children who can draw, paint, and sculpt better than I can read and write. The poetry in the volume is consistently good. With the exception of one nicely executed pantoum by Lexi White, the poems are free verse but contain many poetic elements, particularly assonance, consonance, alliteration, imagery (often vivid), and the occasional plays on words. My favorite longer poem in the issue is “What the Twig Wants” by Rebe Huntman, which folds all of the aforementioned elements into a beautiful, almost pastoral narrative. My favorite shorter poem is “Dialect” by Amber New, which leverages all of the above elements plus some clever enjambments to create a delightful aural affair. The faculty and students at the Columbus College of Art & Design publish Botticelli Mag in the spring and fall. 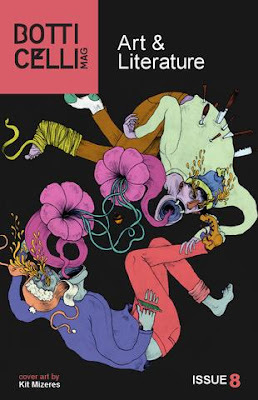 Enjoy Issue 8--the fall 2015 edition--online for free here http://wp.botticellimagazine.com/?page_id=126.